Last weekend I went to B.C. to the Shuswap for Thanksgiving. I love B.C. in the fall! Beautiful colours on all of the trees. Perfect place to spend Thanksgiving. 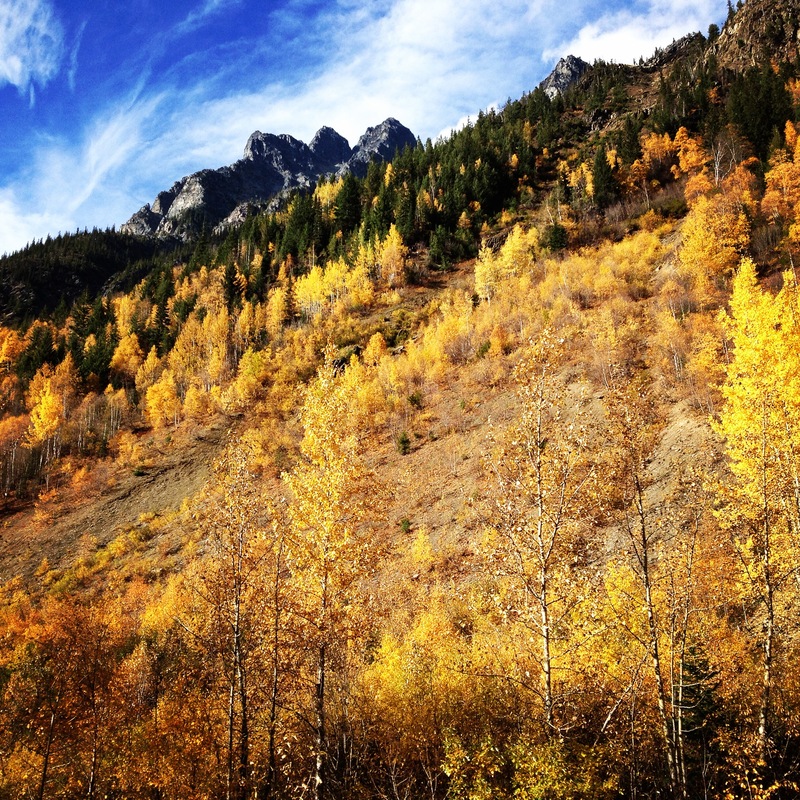 It is such a gorgeous drive through the mountains with the yellow, red and orange leaves on the trees. The drive was sunny most of the way but sadly once we got to B.C. the weather turned cloudy although it stayed fairly warm and didn’t rain. 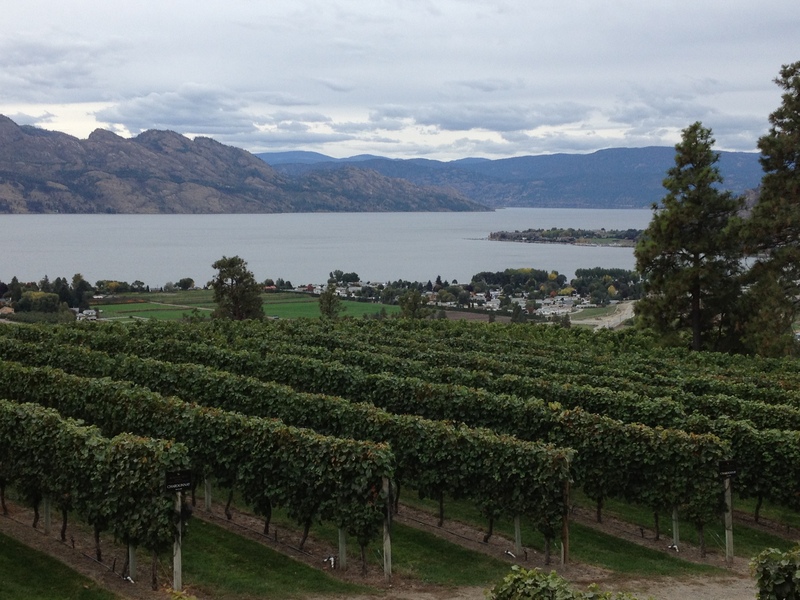 Aside from spending Thanksgiving in the beautiful surroundings in B.C., the other thing that made it perfect was that it was the Okanagan wine festival. 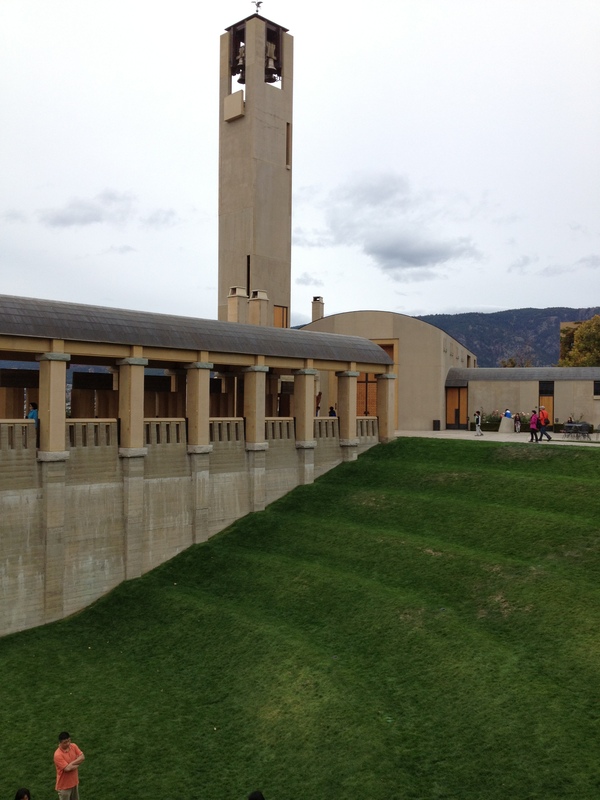 There were events at most of the wineries in the area and around Kelowna. We stopped at three of the wineries for tastings, Mt. Boucherie, Volcanic (they have amazing ice wine) and Mission Hill. All of the wineries are picturesque, especially with the fall colours and the views over the lake, and they all had some very tasty wines. Mission Hill is one of the biggest wineries in the area, it is up on the hill and is definitely worth a visit, the setting is gorgeous, with views over the lake and vineyards, and the winery itself is reminiscent of an Italian winery. 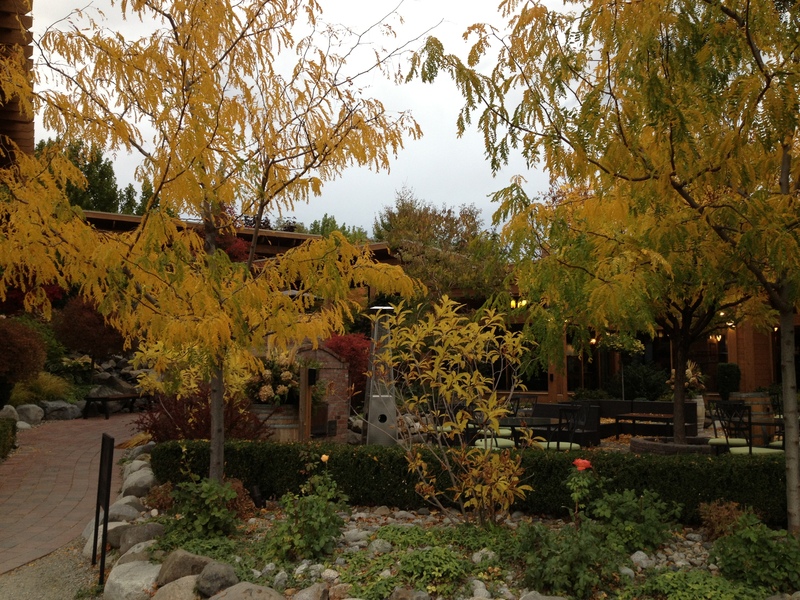 After touring the wineries we went to the Old Vines restaurant at Quail’s Gate winery for our Thanksgiving dinner. The dinner was a special wine festival set menu dinner with wine pairings. It was delicious! Four courses, all of them very tasty. The dessert was especially impressive, a dark chocolate disk on top of a cake then covered with a warmed fruit sauce. Delicious! The view from the restaurant is one of the best in the area, unfortunately it was not a clear day but the setting was still lovely with the trees in full fall colours. The next day we drove out to the Adam’s River and Roderick Haig Brown provincial park to watch the salmon run. Every four years there is a surge in the number of salmon that come back to the rivers in central B.C. to spawn. This was one of those years and the Adam’s river was full of sockeye salmon. Apparently only two fish from the thousands of salmon eggs laid by one female actually make it back to the river where they were born. 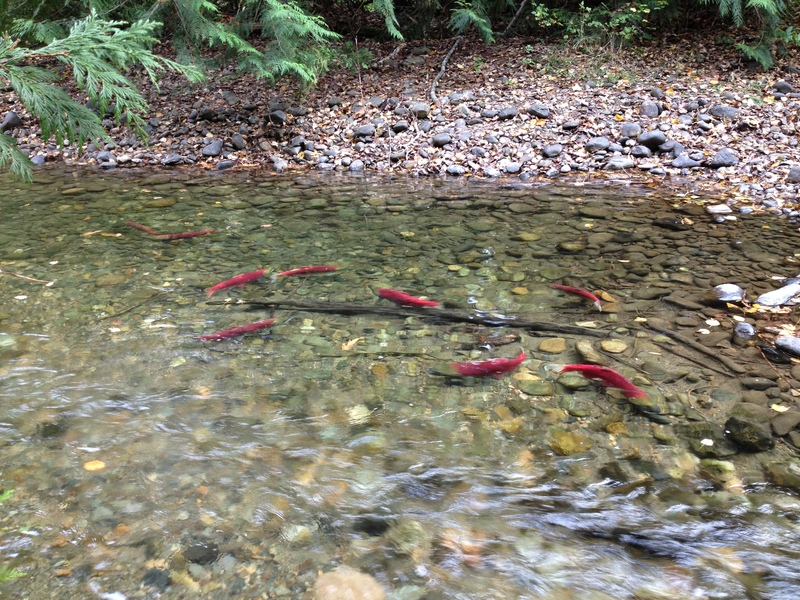 During the Salute to the Sockeye festival at the park, which takes place the first three weeks of October, a fee of $5 is charged to enter the park and watch the salmon. There are nice walking paths, a viewing platform and signs along the paths providing information on the salmon run. 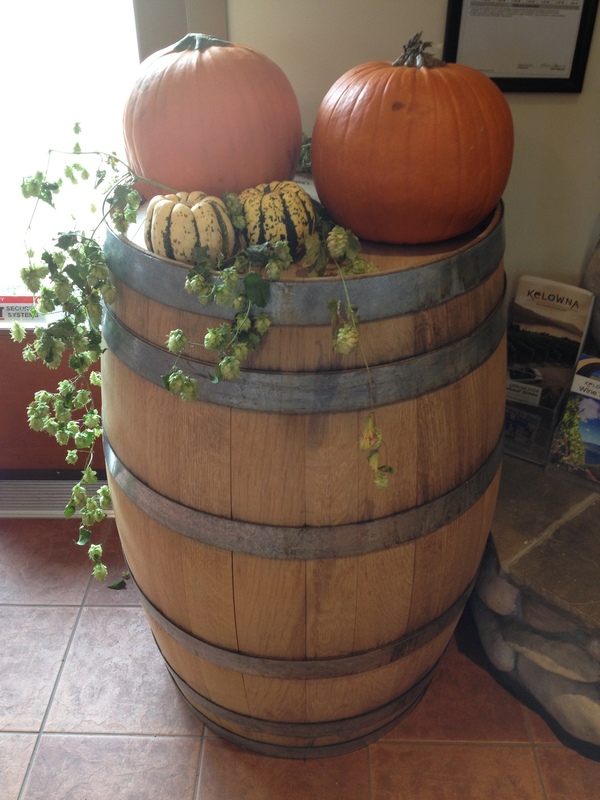 It was actually the second Thanksgiving I spent wine touring and enjoying the lovely fall colours. The first was a couple of years ago in Ontario. I went with a friend from Calgary to spend Thanksgiving with my best friend in Ontario. 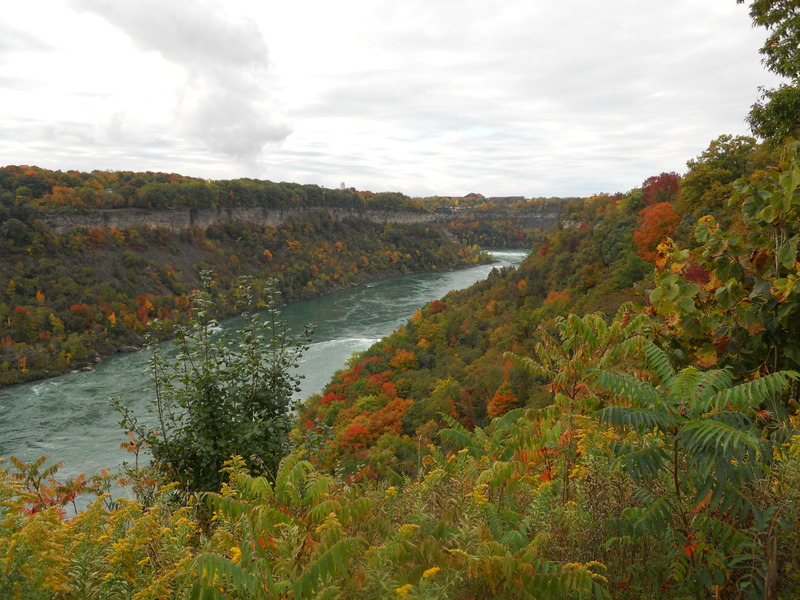 We toured Toronto and Niagara to see the fall colours and also stopped by some of the wineries around the Grimsby area on our way to and from Niagara on the Lake where we stayed for a night. 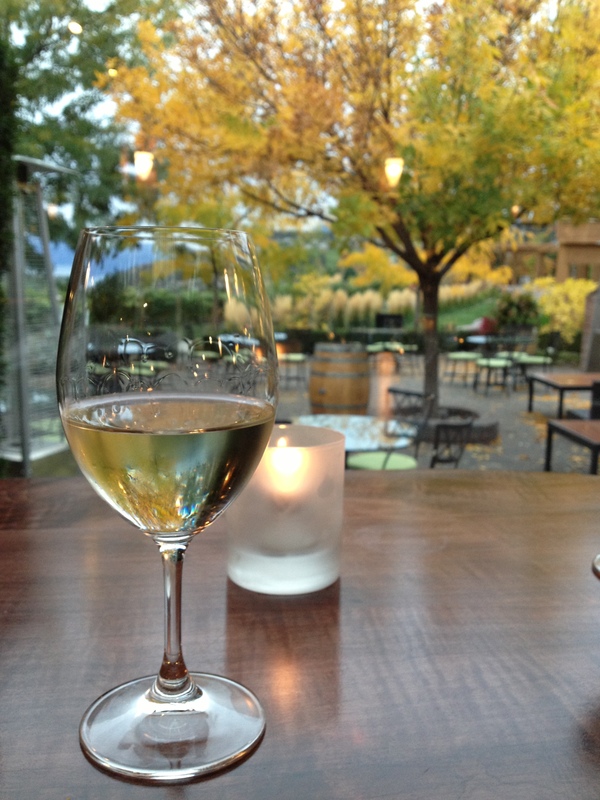 Similar to B.C., many of the wineries have restaurants with menus which include wine pairings and of course the wineries offer regular tastings. I have found that most of the winery restaurants are delicious (Hillebrand is one of my favourites in Niagara on the Lake, Angel’s Gate along Beamsville Bench is amazing), plus the wine pairing menu is a great way to taste different wines. 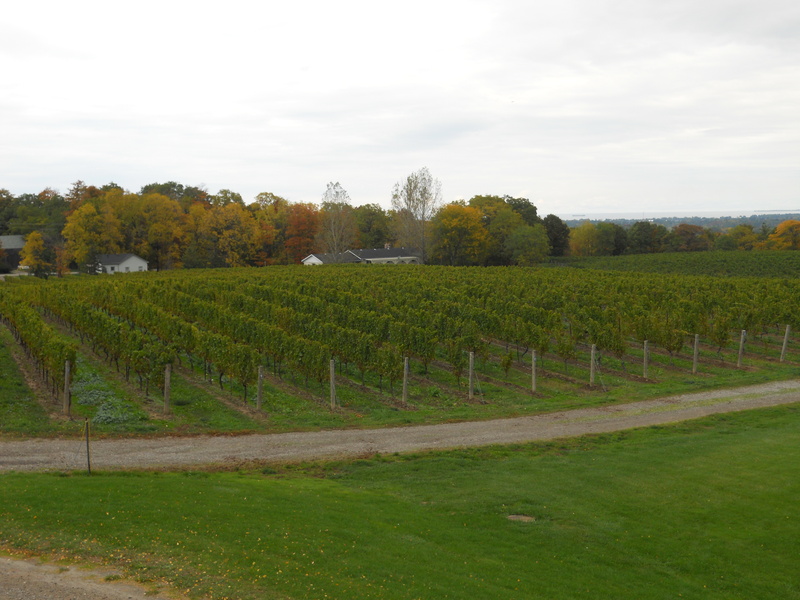 There are wineries scattered from Grimsby all the way to Niagara on the Lake, ranging from boutique wineries, like Organized Crime, to the big producers like Jackson-Triggs. The wine route is well marked, although many of the boutique wineries are off the beaten track, but there are maps of the area that make it easy to find all of the wineries. Niagara on the Lake has great shops, restaurants and is surrounded by many wineries. In the fall the Shaw Festival is still on with plays at the theatres throughout the town. 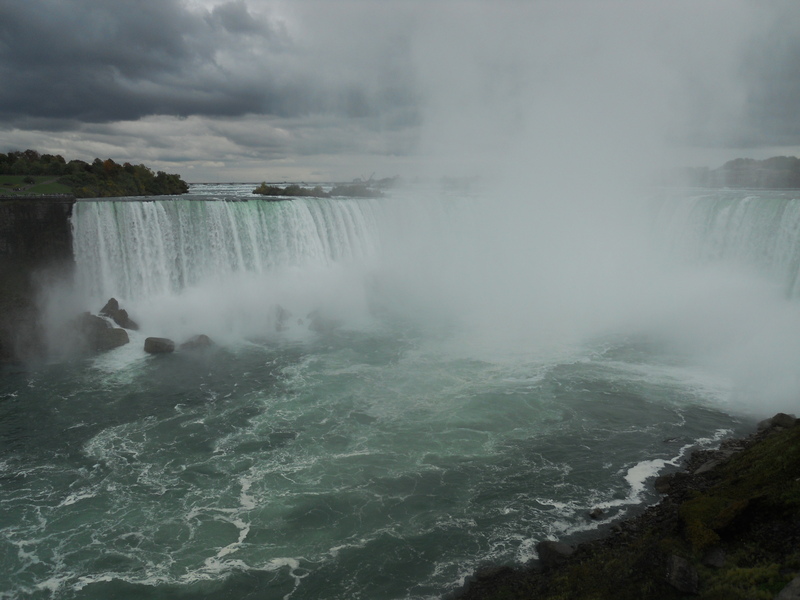 After spending some time in Niagara on the Lake we drove the wine route from Niagara on the Lake to Niagara Falls. Although I missed getting turkey dinner this year, I loved spending Thanksgiving at the wine festival. During the fall around Thanksgiving there are often wine festivals and other events making it a great time to visit the wine regions. Plus it isn’t the high season so some of the hotels will have package deals that include dinners or wine tours. I think I may need to make wine touring a Thanksgiving tradition, at least every couple years since I would hate to miss turkey every year no matter how good the wine is. At the end of my Rocky Mountain road trip (see previous post) I arrived at Mara Lake in the Shuswap to spend some time relaxing in the sun. What better place than at a cabin (cottage for you Easterners) at Mara Lake which is surrounded by mountains and where the weather is almost always perfect. I have been coming to this area for years and it never disappoints. 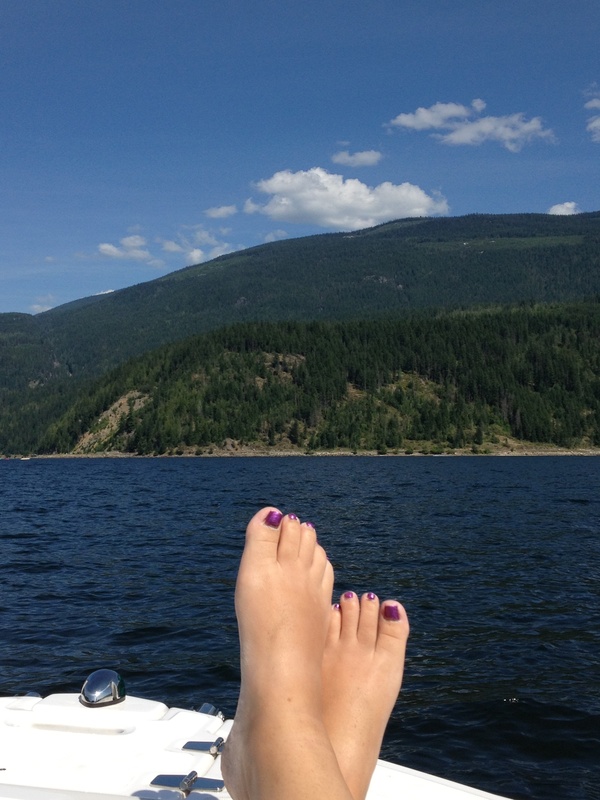 This year has been a particularly fabulous summer all over Western Canada and the Shuswap was the same. Clear blue skies and sunny hot weather are the norm in the summer in the Shuswap and this year was no exception (my coldest day while I was there was 27 degrees). An ideal place to go within a beautiful half day drive from Calgary. 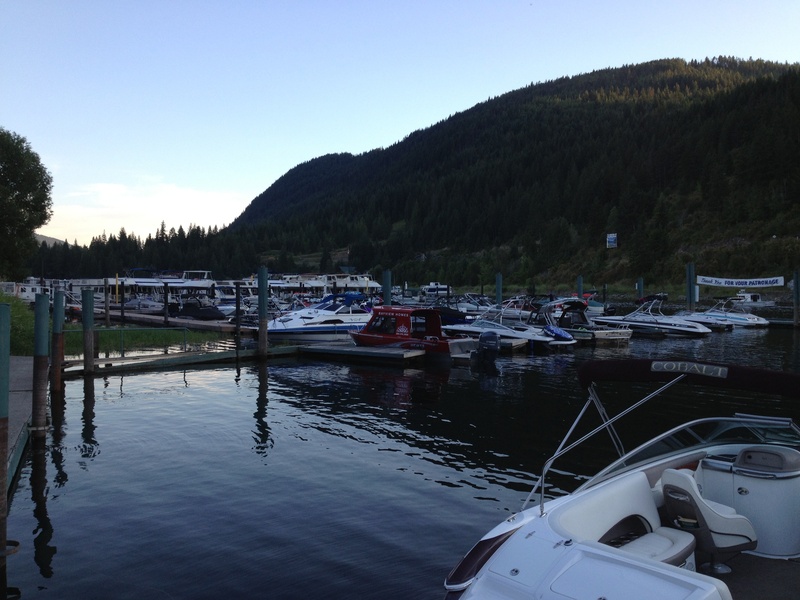 I started out with dinner at Moose Mulligans where there is a great patio looking out over the Sicamous narrows. There is a dock if you would rather boat over than drive. It is a great place to spend an afternoon or evening with food and drinks enjoying the nice weather and watching the boats go by. This beautiful area has so much to offer. 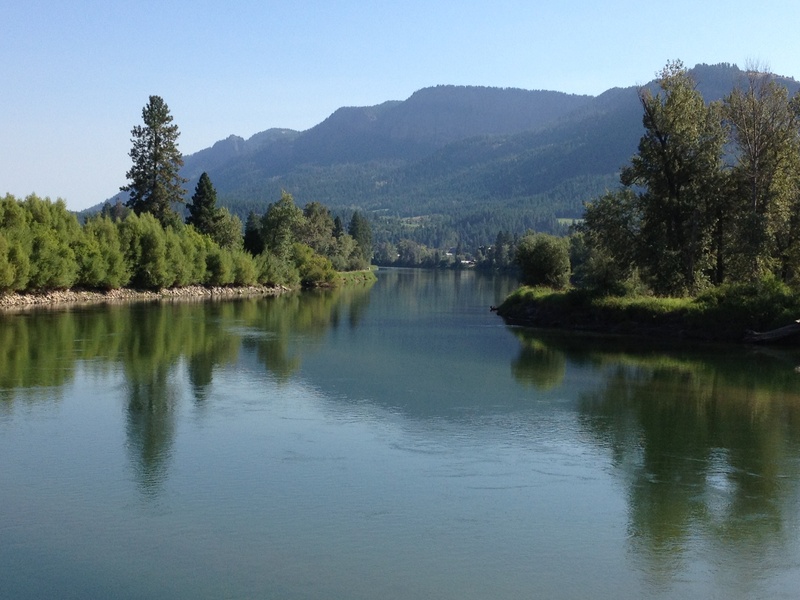 From Mara Lake by car there are easy day trips to Salmon Arm, Enderby, Vernon, Kelowna and to the many wineries in the area. 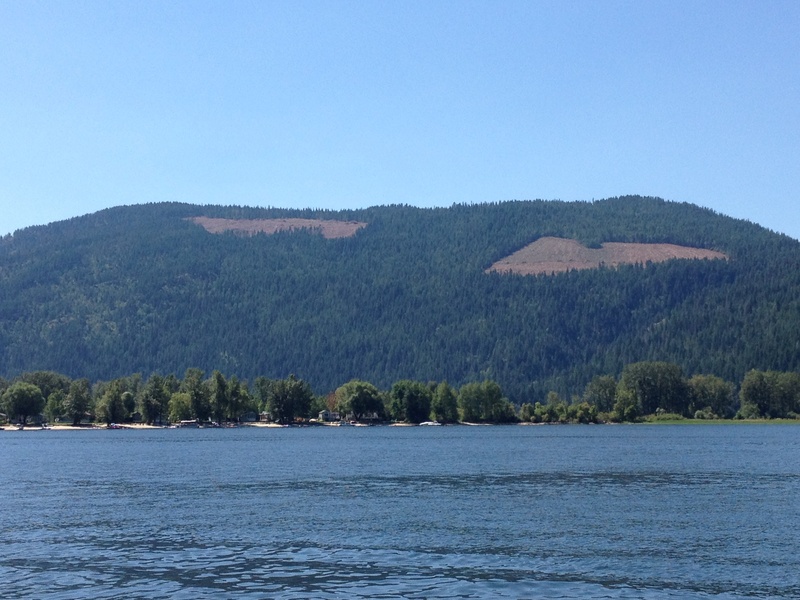 By boat the entire Shuswap is available to explore through the many lakes which are all accessible by heading through the narrows in Sicamous. Whether you go by boat or car, the beauty of the area is apparent everywhere you look. I went to Vernon one day for lunch and the drive itself was worth the trip. 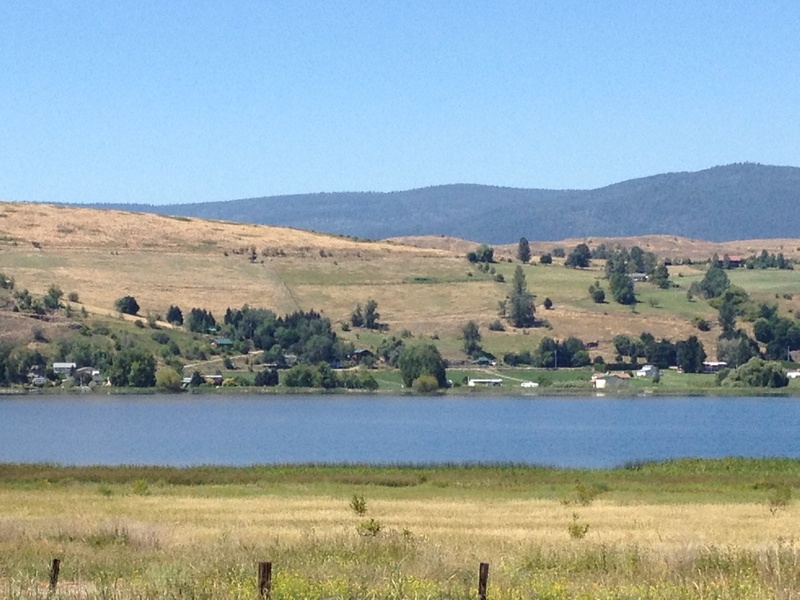 Vernon is great too as it has lakes, wineries, a ski hill (good for hikes in the summer) and lots of restaurants to choose from. I also spent some time in Salmon Arm. One of my favourite things to do there is to have lunch at the Shuswap Pie Company. Warning, they are closed on Sundays so plan accordingly. The meat pies and the dessert pies are both amazing! My personal favourite is the raspberry rhubarb pie, absolutely delicious. My second favourite thing to do there is to go to DeMille’s farmers market. They have great fruits and vegetables as well as baked goods, organic meats, sauces, cheeses etc. I took my nieces for a visit so they could see the farm animals outside the market, which they loved. There are some great walks in Salmon Arm down by the water. The pier area overlooking the marina and the lake is nice with lots of benches to hang out on and enjoy a coffee or to sit and read. The park beside the pier has picnic tables and benches as well. From the park you can continue to walk along the path, but you have to walk through the parking lot to get to the path on the other side. Another nice place to walk around is Enderby. There is a river walk that is lovely and there are some nice cafes to stop in at, my favourite is Cliffs on the highway through town. Starting in Enderby you can float down the river in a tube, on an air mattress or in a raft, it looks like fun although I haven’t done them yet. But be warned, the river is slow moving and it can apparently take up to 12 hours to get to the next town so plan carefully where you want to get out of the river. 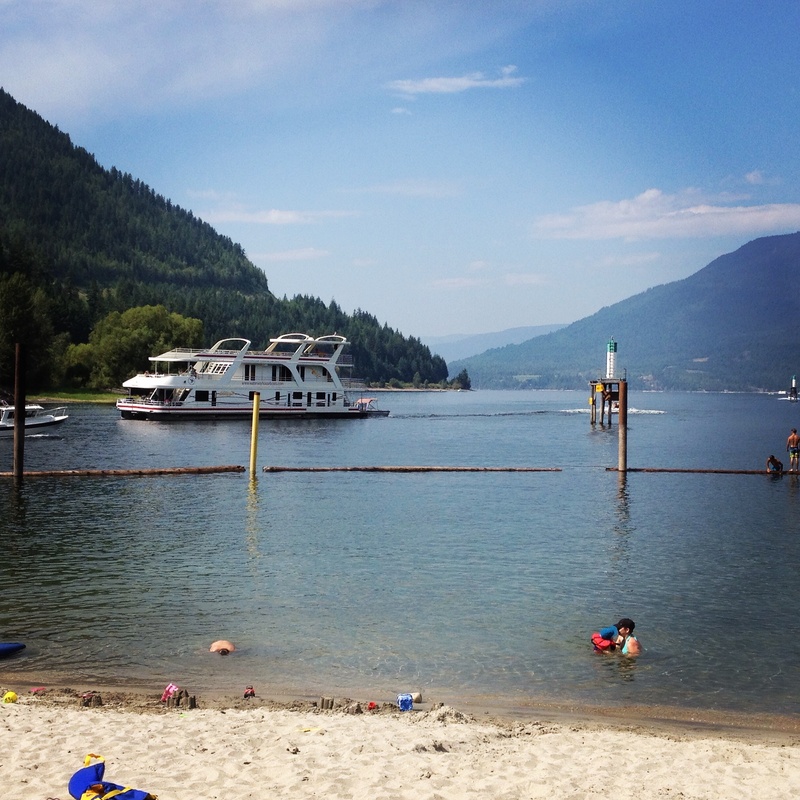 Although Sicamous is a smaller centre it is a nice place to stay or at least worth a visit, especially for the public beach area. The beach has a swim area as well as a kids park and a path to walk along plus there is a public boat launch. If you like trains or boats it is a great spot to watch the trains going over the bridge or the boats going under the bridge. 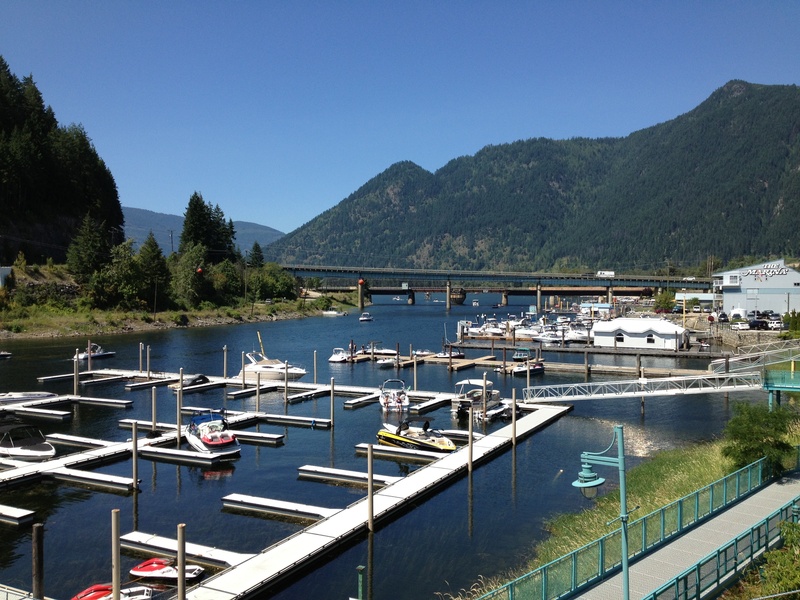 Sicamous is the houseboat capital of Canada and there is a regular stream of houseboats going in and out of the narrows past the beach. The houseboats range from very basic to quite fancy, loaded with slides, sea doos or even speedboats. 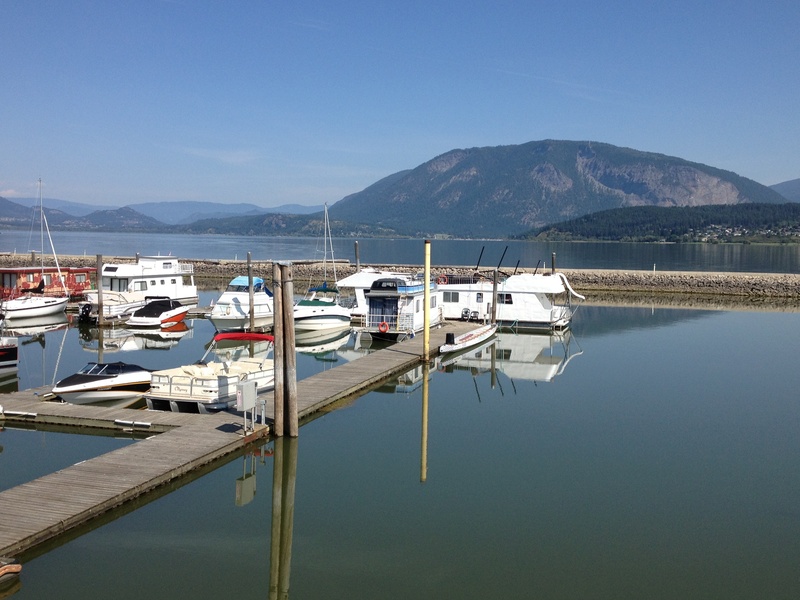 All around the Shuswap are areas for the houseboats to dock for the day or the night, there are even floating stores and gas stations. 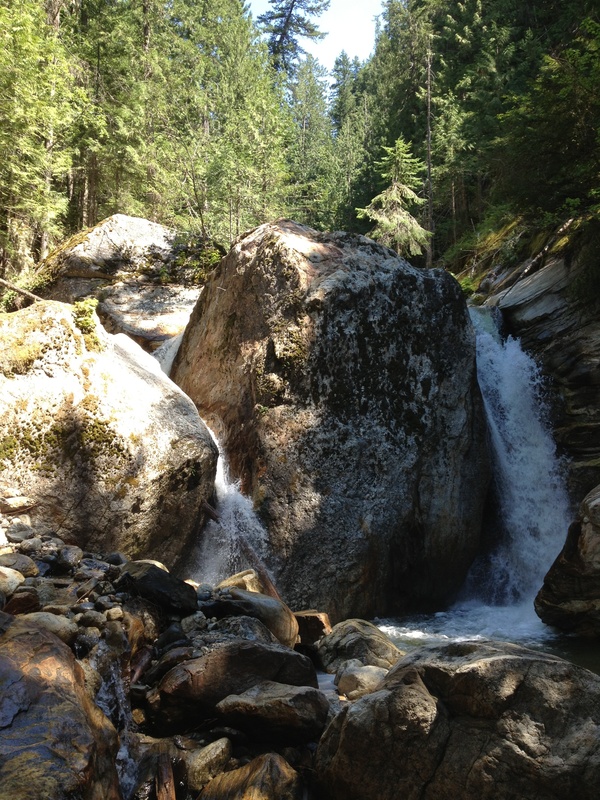 Another nice walk is to the waterfall near Sicamous. There is a sign off highway 97A directing you to the parking area. Unfortunately the area was flooded and is currently under repair so instead of a continuous walk the walk is split into two, one down the creek and the other up to the waterfall area. It is a short, easy hike so almost anyone can do it (I went with two 3 year olds and they managed just fine), although there are some stairs on the waterfall side. Once you are at the waterfall it is very beautiful and peaceful. Despite the many lovely things to see, I spent most of my time on the beach near the cabin or on the boat on Mara Lake. 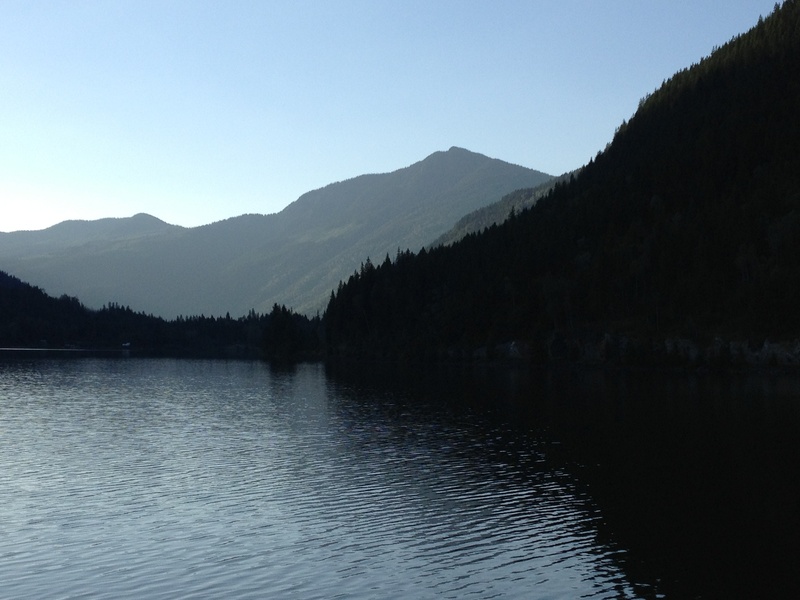 It was wonderfully relaxing to float around the lake, taking a refreshing dip in the water when I got too hot. The lake isn’t the warmest lake as it is mountain-fed, but by mid-July it is usually nice and this year it was even quite warm because of the hot weather this summer. Plus, you can’t beat the scenery! 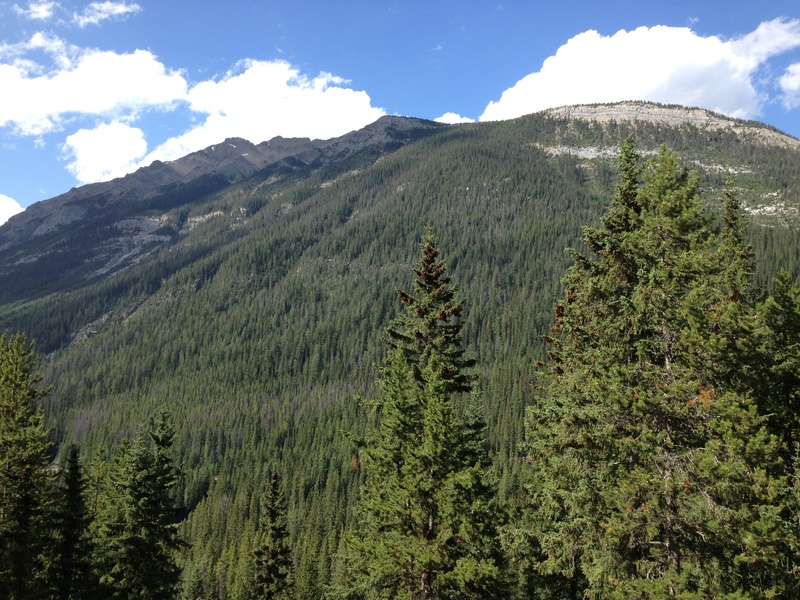 When I was a child summer always involved a road trip through the mountains pulling the trailer to the interior of British Columbia to spend 2 weeks in the Okanagan or Shuswap enjoying the hot weather, mountains and lakes. I continue to take this trip every year, although now it is usually only as far as the Shuswap. No matter how many times I do this trip, the scenery still awes me. 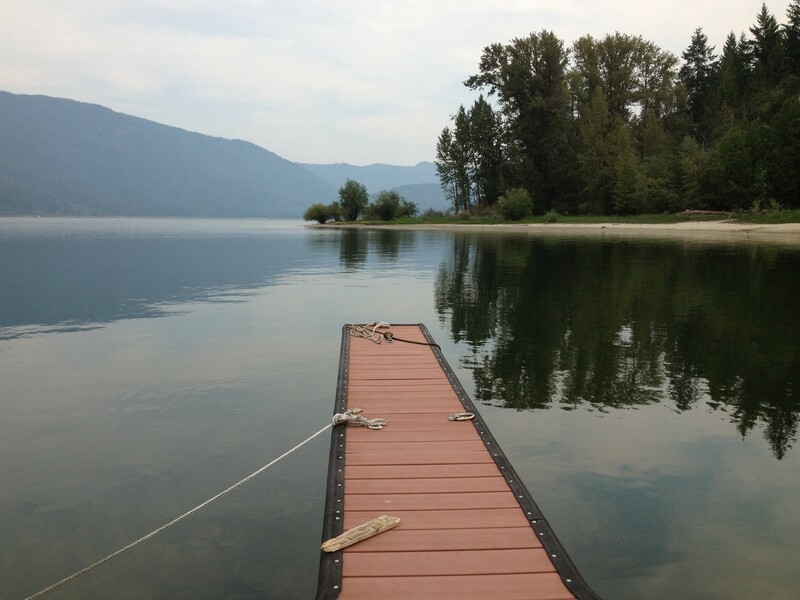 As I have for the past number of years, this year I am heading to Mara Lake in the Shuswap. Starting from Calgary on a clear day you can see the mountains in the distance the entire way. Fortunately for me I set out with the sun shining and only fluffy white clouds in the sky. 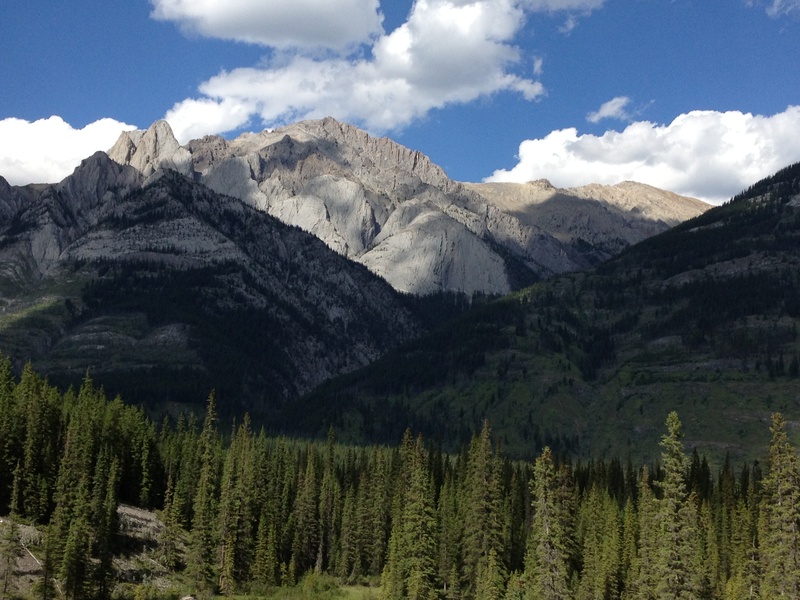 The mountains look lovely from afar but it isn’t until you pass Kananaskis that you really appreciate their size. Once arriving in the mountains every turn offers another amazing view. One of my favourites is when you first see Castle Mountain. There are many places to stop along the way, Canmore, Banff, Lake Louise, Moraine Lake, and many other lakes, rivers and hiking trails. Sometimes I stop along the way but this time I didn’t stop until the spiral tunnels which is an historic site detailing how the railway route to navigate the steep passes approaching Golden changed over time. The information is interesting and the views stunning. Next stop was Golden. 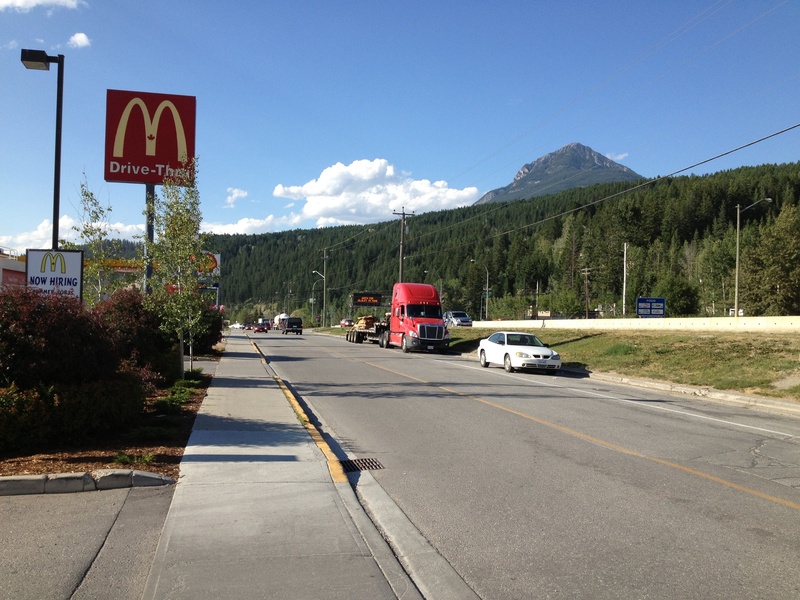 The town is surrounded by mountains and has a great ski hill, Kicking Horse, but I rarely stop there except for a rest stop and food. If I don’t stop for food in Golden I always stop in Revelstoke at Mainstreet Cafe for their baked goods, sandwiches or soup, or, if I’m really lucky and drive through on the right day, their amazing perogies and sausage. Sadly this time I wasn’t able to stop there, the timing didn’t work. 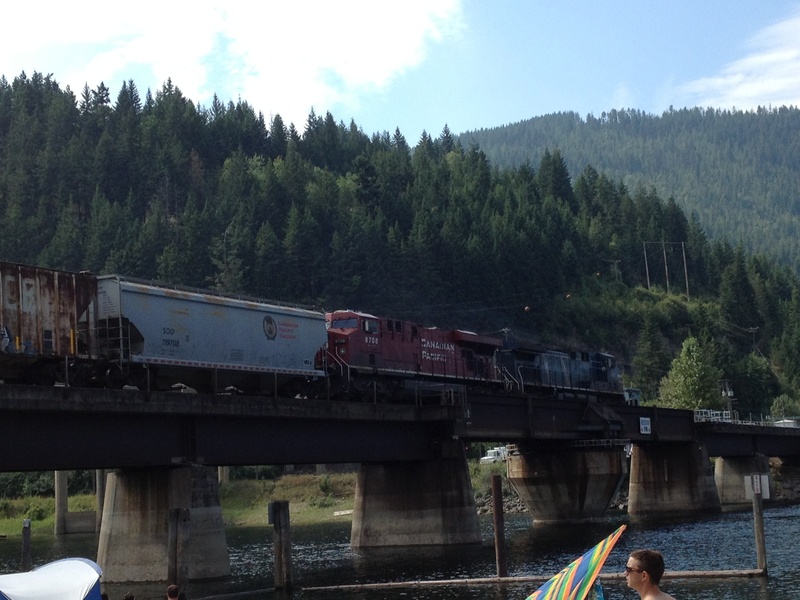 So aside from a quick stop in Golden I drove straight through to Sicamous. But I still managed to snap a few pictures of beautiful Three Valley Gap on the way through. After a drive of approximately 45 minutes I arrived in Sicamous to end my road trip with a delicious dinner at Moose Mulligans pub on the Sicamous Narrows. 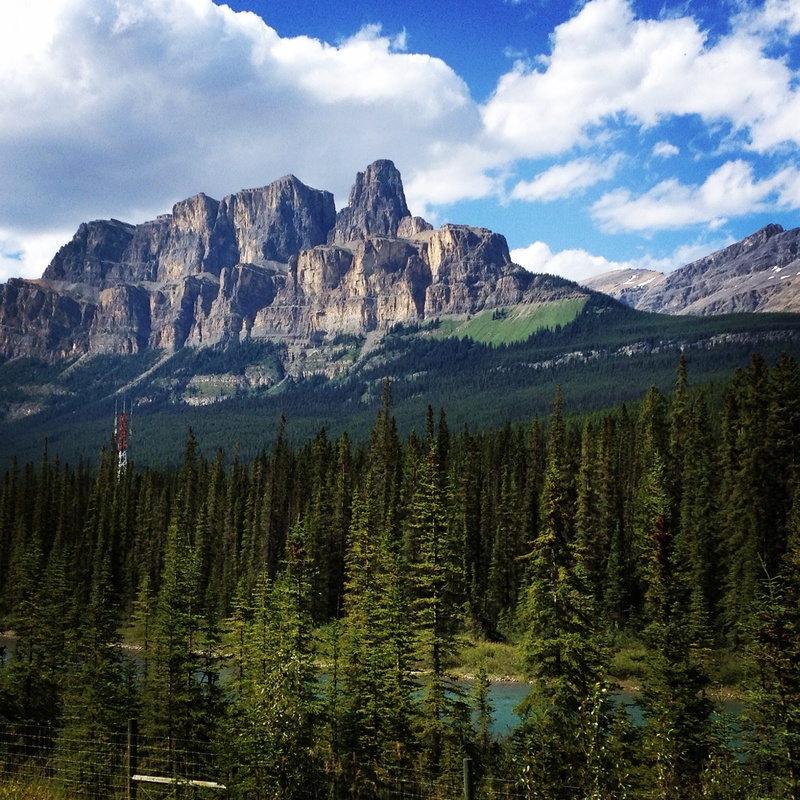 Although I have been to many beautiful places in the world, the drive through the Canadian Rockies will always be on my list of the most amazing places to see in the world and an essential part of my summer. To transfer or not to transfer?